Dirk Gently’s Holistic Detective Agency is a TV series, written by Max Landis who is the successful Screenwriter. Samuel Barnett is a famous actor and a leading actor in this tv series, he was born on April 25, 1980. 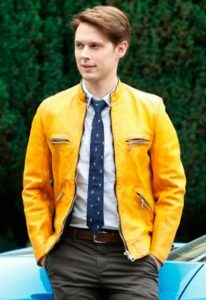 He is wearing a bright yellow color leather jacket in this TV series, that is getting so famous too. This Dirk Gently’s Jacket is eye-catching and sophisticated style.